Piece of Speaks: Mario Maurer and Erich Gonzales' Movie Updates: Suddenly It's Magic! 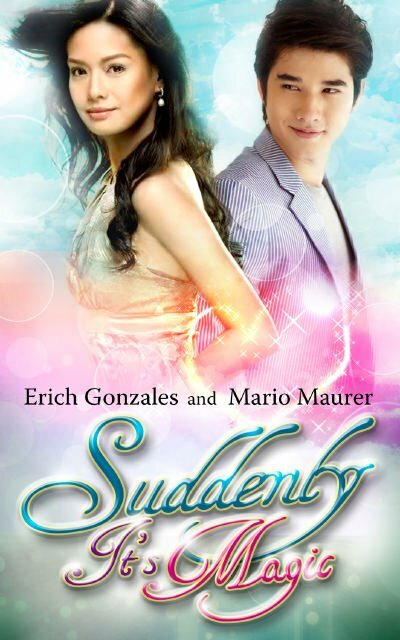 Mario Maurer and Erich Gonzales' Movie Updates: Suddenly It's Magic! Yesterday, October 26, 2011 Thai actor Mario Maurer (A Little Thing Called Love) returns to the Philippines to join Philippine Fashion Week. In an interview, he shares possible locations of his first Philippine movie with none other than Erich Gonzales! Maurer who first appeared in the award winning Love of Siam shares details about his upcoming movie under Star Cinema with Erich Gonzales. He wants the movie to be shot in Philippines and his country Thailand. The good looking Thai actor became a household name in the Philippines when his romantic comedy teen film "A Little Thing Called Love' was aired by ABS-CBN. P' Shone, his character has been an unforgettable character name. To watch the interview just click here. I'm excited to see this movie! KILIIIIG! TO THE MAX! ERICH AND MARIO SANA MAGKATULUYAN KAYO IN REAL LIFE! ANG DAMING MARRICH FANS ANG EXCITED SA SUDDENLY ITS MAGIC! Soo Excited! ABS did a Good choice of Erich Acting skills palang palong-palo nah! sama pa ang Pinay BEauty niya..!! and She's SMART..
ano kayang role ni erich dito..KATULONG, MAID? TAGALINIS,JANITRESS... Siguro mandidiri sa kanya si Mario HAHA! ayy WALA DAW "K" si Erich mag english... Baka mahirapan si Mario. hoi bka ikaw d runong mag english noh? husga k ng husga akla mo nmn mrunong krin inngit ka lng kay erich alang pnma sau... tae ka....bka ptayin kita eh..knowing pnmn kita...mag ingat ka bwahahahaahaha......takot ka unggoy kah.